Molecular separations are at the heart of chemical engineering, and nanostructured membranes are emerging as a low-cost alternative to traditional separation processes. However, most membranes struggle to maintain performance in harsh environments. For example, redox flow batteries (RFBs) rely on a cation exchange membrane to store energy. To create an RFB capable of storing enough energy to power a city (>1 MWh) for 20+ years without capacity loss, an extremely robust membrane chemistry would be required, such as a perfluoro sulfonic acid (PFSA) membrane. However, PFSA is expensive to manufacture, has mechanical and performance issues, and generates substantial quantities of bioaccumulative and toxic substances during production. In many cases, PFSA membranes account for more than 20% of the total battery system costs. Researchers have been searching for more than three decades to find a material capable of delivering better performance at a lower cost. 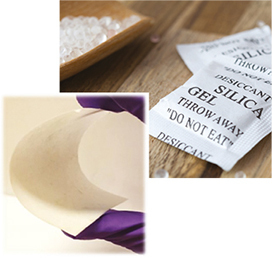 ▲ Silica gel packets contain little beads that absorb excess moisture in shoe boxes and beef jerky. Membrion has devised a simple process to make ceramic membranes using silica gel. Unlike other nanoporous ceramic membranes, they are flexible. These flexible nanoporous ceramic membranes can separate protons from vanadium ions in redox flow batteries. With funding from the National Science Foundation (NSF), researchers at Membrion, Inc., have patented a potential solution that uses the desiccant commonly found at the bottom of a beef jerky package. Membrion has developed a self-assembly process for silica gel that enables its use as a low-cost and high-performance ceramic cation-exchange membrane. “We were trying to lower the costs of RFBs by finding a cheaper alternative to PFSA that could handle the extreme conditions. Ceramics seemed like a logical choice, but they tend to be brittle and not well suited for the high compression in stack applications like RFBs. Our real innovation was in making a flexible and compressible ceramic membrane,” says Membrion’s Founder and Chief Technology Officer, Greg Newbloom. The company takes a unique approach to membrane synthesis. Typically, PFSA and other ion-exchange membranes are manufactured using a solvent-casting approach in clean room environments, which is time-consuming and contributes substantially to their costs. In contrast, Membrion utilizes a dip-coating process that can be completed in a typical manufacturing environment. This novel membrane processing method starts with a nonwoven glass mesh commonly used as roofing insulation in the construction industry. Membrion scientists add a polymeric edging to the outer rim of the mesh to act as a gasket for the compressive loads in stack environments. They dip this polymer-edged glass mesh in a silica solution that wicks into the mesh, and then dip the mesh in a commodity acid. The end product is a percolated nanoporous ceramic membrane with a 2-in. bending radius. The pores of the ceramic membranes may be tuned to a radius of 0.4–3 nm. Using silane chemistry, the membranes can be further functionalized for applications beyond RFBs, possibly for water desalination and biopharmaceutical purifications. To date, Membrion and third-party laboratories have demonstrated performance parity with commercial PFSA membranes in RFBs. However, these novel ceramic membranes can be produced at one-tenth the manufacturing costs of PFSA because their raw materials and dip-coating production process are less expensive. And, the production process eliminates toxic waste streams, instead generating only salt, sand, and water as byproducts. Membrion is in the process of commercializing their technology with their nine-member team in Seattle, WA. “The cost savings and performance benefits that this technology delivers could disrupt the energy storage industry. Beyond that, flexible ceramic membranes have the potential to deliver low-cost, high-performance molecular separations that many industries could benefit from,” says Newbloom.